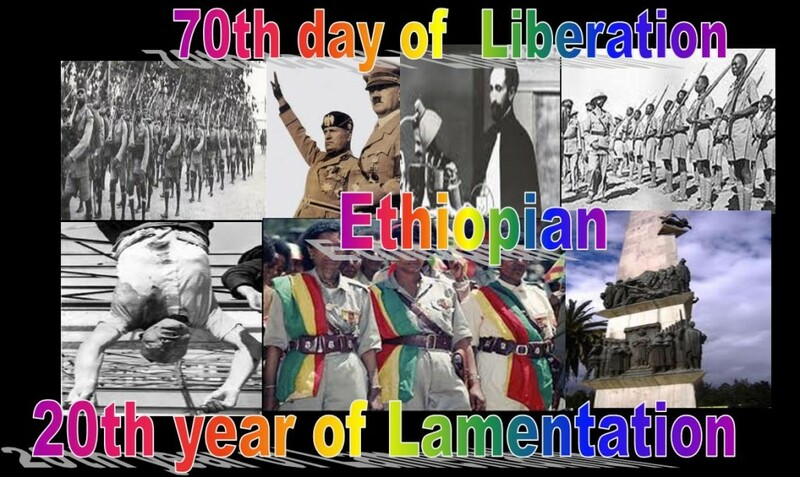 It has passed seven decades since Ethiopia was liberated from fascist occupation and mourns 2 decades of dictatorial regime which divide the country according to cartography. The new Ethiopian dictator passed this great day like nothing happen and unordinary day in the lives of the Ethiopians. Italian dictator Benito Mussolini had long held a desire for a new Italian Empire. Reminiscent of the Roman Empire, Mussolini’s new empire was to rule over the Mediterranean and North Africa. His new empire would also avenge past Italian defeats. Chief among these defeats was the Battle of Adowa which took place in Ethiopia on March 1, 1896. Mussolini promised the Italian people “a place in the sun”, matching the extensive colonial empires of the United Kingdom and France. Today Ethiopia is ruled by a home made dictator with a megalomaniac sprit not far from his oracle Bhutto Mussolini. This new dictator of the 21st century is dreaming to build dams and in human construction in the image of Stalin. Different to Mussolini who likes to possess Ethiopia Melese Zenawie has sold the most fertile land of the country to the foreign grabbers while his people are dying from hunger and starvation. For Mussolini Ethiopia was a prime candidate of this expansionist goal for several reasons. Following the Scramble for Africa by the European imperialists it was one of the few remaining independent African nations, and it would serve to unify the Italian-held Eritrea to the northwest and Italian Somaliland to the east. It was considered to be militarily weak, and rich in resources. But for Melese Zenawi Ethiopia is a country to be Balkanized to many ethnical states. Italy was able to launch their invasion without interference primarily due to the United Kingdom and France placing a high priority on retaining Italy as an ally in case hostilities broke out with Germany. To this end, on January 7, 1935, France signed an agreement with Italy giving them essentially a free hand in Africa to secure Italian co-operation. Next, in April, Italy was further emboldened by being a member of the Stresa Front, an agreement to try and control German expansionism.In June, non-interference was further assured by a political rift that had developed between the United Kingdom and France following the Anglo-German Naval Agreement. The Italo–Ethiopian Treaty of 1928 that delimited the border between Italian Somaliland and Ethiopia stated the border was 21 leagues parallel to the Benadircoast. Acting on this, they built a fort at the Walwal oasis (Italian Ual-Ual) in the Ogaden desert in 1930 and garrisoned it with Somalidubats (irregular frontier troops commanded by Italian officers). In November of 1934, Ethiopian territorial troops escorting the Anglo-Ethiopian boundary commission, protested Italy’s incursion. TheBritish members of the commission soon withdrew to avoid an international incident but Italian and Ethiopian troops remained encamped in close proximity. In early December, the tensions mounted to a clash that left 150 Ethiopians and 50 Italians dead. This resulted in the Abyssinia Crisis at the League of Nations. The League of Nations exonerated both parties for the Walwal incident in September 1935. Italy soon began to build its forces on the borders of Ethiopia in Eritrea and Italian Somaliland. With an attack appearing inevitable, the Emperor Haile Selassie ordered a general mobilization. His new recruits consisted of around 500,000 men, many of whom were armed with nothing more than spears and bows. Other soldiers carried more modern weapons, including rifles, but many of these were from before 1900 and were badly outdated. According to Italian estimates, on the eve of hostilities the Ethiopians had an army of 350,000 men. Only about one-quarter of this army had any kind of military training and the men were armed with rifles of every type and in every kind of condition. In general, the Ethiopian armies were poorly equipped. They had about 200 antiquated pieces of artillery mounted on rigid gun carriages. There were also about 50 light and heavy anti-aircraft guns (20 mm Oerlikons, 75 mm Schneiders, and Vickers). The Ethiopians even had some Ford truck-based armored cars and a small number of Fiat 3000 World War I-era tanks. The service-able portion of the Ethiopian air force included three tiny and outmoded biplanes. The best Ethiopian units were Haile Selassie’s “Imperial Guard.” These troops were well-trained and better equipped than the other Ethiopian troops. But the Imperial Guard wore a distinctive greenish-khaki uniform of the Belgian army which stood out from the white cotton cloak (shamma) worn by most Ethiopian fighters, and proved to be an excellent target. In April 1935, the Italian build-up in East Africa started in earnest. In a few months, five regular army divisions and five Blackshirtdivisions arrived in Eritrea. One regular division and a few Blackshirt battalions arrived in Italian Somaliland. These units alone, which did not include Italian units already in East Africa, native units, or units arriving during the war, represented 7,000 officers and 200,000 men. The equipment for the build-up alone included 6,000 machine guns, 700 pieces of artillery, 150 tankettes, and 150 aircraft. On October 3, 1935, Marshal Emilio De Bono advanced into Ethiopia from Eritrea without declaration of War. De Bono had a force of 100,000 Italian soldiers and 25,000 Eritrean soldiers under his command. A smaller force, under the command of General Rodolfo Graziani, advanced into Ethiopia from Italian Somaliland. By October 6, Adwa was captured by De Bono’s forces. Adowa was the site of Italian defeat in the First Italo–Ethiopian War (1895-1896). By October 15, De Bono’s forces moved on to capture the holy capital of Axum. 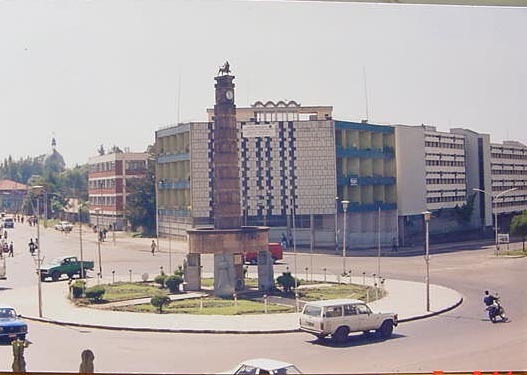 The invading Italians looted the Obelisk of Axum after capturing the city. On October 7, the League of Nations declared Italy the aggressor and started the slow process of imposing sanctions. These did not extend to several vital materials, such as oil. The British and French argued that if they refused to sell oil to the Italians, they would then simply get it from the United States, which was not a member of the League (the British and French wanted to keep Mussolini on side in the event of war with Germany, which by 1935 was looking like a distinct possibility). In an effort to find compromise, the Hoare-Laval Plan was drafted (which essentially handed 3/5ths of Ethiopia to the Italians without Ethiopia’s consent on the condition the war ended immediately), but when news of the deal was leaked public outrage was such that the British and French governments were forced to wash their hands of the whole affair. By mid-December, De Bono was replaced by General Pietro Badoglio because of the slow, cautious nature of his advance. Haile Sellassie decided to test this new general with an attack, but his forces were repelled due to the Italians’ superiority in heavy weapons like machine guns and artillery. On January 20, 1936, the Italians resumed their northern offensive at the First Battle of Tembien between the Warieu Pass andMek’ele. The fighting proved inconclusive and ended in a draw on January 24. Following the capture of Amba Aradam (Battle of Enderta) on 15 February, the Italians advanced again on the northern front, commencing the Second Battle of Tembien on 27 February. This resulted in an Italian victory and the fall of Worq Amba. At the Battle of Maych’ew on 31 March 1936, the Italians defeated a counteroffensive by the main Ethiopian army, including the Imperial Guard, under Haile Selassie. During the final months of 1935 the Italian had also advanced from the south through the Ogaden Desert from Somalia. There were clashes on the River Dewa (30 October), Hamaniei (11 November) and Lama Scillindi (25 November). On 31 December the Italians occupied Denan. Between January 12 and January 16, 1936, the Italians defeated the southermost Ethiopian army in the Battle of Genale Wenz. After a February lull, the Italians began a major thrust towards the city of Harar. On March 29, Graziani’s forces firebombed and subsequently captured the city. Two days later, the Italians won the last major battle of the war, the Battle of Maychew. Haile Selassie fled into exile on May 2, and Badoglio’s forces took the capital, Addis Ababa, on May 5, 1936. Italy annexed the country on May 7, and the Italian king, Victor Emmanuel III, was proclaimed emperor on May 9. Italy merged Eritrea, Ethiopia and Somaliland into a single state known as Italian East Africa. In addition to conventional weaponry, Badoglio’s troops also made substantial use of mustard gas, in both artillery and aerial bombardments. In total, the Italians deployed between 300 and 500 tonnes of mustard gas during the war, despite having signed the1925 Geneva Protocol. The deployment of gas was not restricted to the battlefield, however, as civilians were also targeted by the Italians, as part of their attempt to terrorise the local population. Furthermore, the Italians carried out gas attacks on Red Cross camps and ambulances. The predominant part of the work of repression was carried out by Italians who, besides the bombs laced with mustard gas, instituted forced labor camps, installed public gallows, killed hostages, and mutilated the corpses of their enemies. Graziani ordered the elimination of captured guerrillas by way of throwing them out of airplanes in mid-flight. Many Italian troops had themselves photographed next to cadavers hanging from the gallows or hanging around chests full of detached heads. One episode in the Italian occupation of Ethiopia was the slaughter of Addis Ababa of February 1937 which followed upon an attempt to assassinate Graziani. In the course of an official ceremony a bomb exploded next to the general. The response was immediate and cruel, as he said “Avenge me! Kill them all!”. The Black Shirts of the Fascist Militia fired randomly into the Ethiopians present at the ceremony killing large numbers, and immediately after poured out into the streets of Addis Ababa where they killed the Ethiopian civilians that they encountered. They also set fire to homes and organized the mass executions of a large groups of people. The massacre claimed lives of 30,000 Ethiopians. When victory was announced on 9 May 1936 from the balcony of Palazzo Venezia, the Italian population (who had not been informed of the use of mustard gas by their troops) was jubilant. On 30 June 1936, Emperor Haile Selassie gave a stirring speech before the League of Nations denouncing Italy’s actions and criticizing the world community for standing by. He warned that “It is us today. It will be you tomorrow”. As a result of the League’s condemnation of Italy, Mussolini declared the country’s withdrawal from the organization. The Italian Empire was officially recognized by the Empire of Japan on November 18, 1936. The occupation was marked by recurring guerrilla campaigns against the Italians, and reprisals which included mustard gas attacks against rebels and the murder of prisoners. In early June 1936, Rome promulgated a constitution bringing Ethiopia, Eritrea, and Italian Somaliland together into a single administrative unit divided into six provinces, Italian East Africa. On June 11, 1936, Marshal Rodolfo Graziani replaced Marshal Pietro Badoglio, who had commanded the Italian forces in the war. In December the Italians declared the whole country to be pacified and under their effective control. Ethiopian resistance nevertheless continued. A failed assassination attempt against Graziani occurred on February 19, 1937. During a public ceremony at the Viceregal Palace (the former Imperial residence) in Addis Ababa, Ethiopia, Abraha Deboch and Moges Asgedom, two men of Eritrean origin, attempted to kill Viceroy Graziani with a number of grenades. The Italian security guard fired indiscriminately into the crowd of civilian onlookers. Over the following weeks the colonial authorities executed about 30,000 persons in retaliation – including about half of the younger, educated Ethiopian population. This harsh policy, however, did not pacify the country. In November 1937, Rome therefore appointed a new governor and instructed him to adopt a more flexible line. Accordingly, large-scale public works projects were undertaken. One result was the construction of the country’s first system of improved roads. In the meantime, however, the Italians had decreed miscegenation to be illegal. Racial separation, including residential segregation, was enforced as thoroughly as possible. The Italians showed favoritism to non-Christianethnicities such as the Oromo, Somali, and other Muslims (some of whom had supported the Italian invasion) by granting them autonomy and rights effectively abolishing slavery and abrogating feudal laws previously upheld by the dominant Amhara rulers of Ethiopia, in an attempt to isolate the Amhara, who had supported Haile Selassie I. Early in 1938, a revolt broke out in Gojjam led by the Committee of Unity and Collaboration, which was made up of some of the young, educated elite who had escaped the reprisal after the attempt on Graziani’s life. In exile in Britain, the Emperor sought to gain the support of the Western democracies for his cause but had little success until Italy entered World War II on the side of Germany in June 1940. Thereafter, Britain and the Emperor sought to cooperate with Ethiopian and other local forces in a campaign to dislodge the Italians from Ethiopia and British Somaliland, which the Italians had seized in August 1940, and to resist the Italian invasion ofSudan. Haile Selassie proceeded immediately to Khartoum, where he established closer liaison with both the British headquarters and the resistance forces within Ethiopia. Ethiopia (Abyssinia), which Italy had unsuccessfully tried to conquer in the 1890s, was in 1934 one of the few independent states in a European-dominated Africa. A border incident between Ethiopia and Italian Somaliland that December gave Benito Mussolini an excuse to intervene. Rejecting all arbitration offers, the Italians invaded Ethiopia on Oct. 3, 1935.Italo-Ethiopian War (1935-36), an armed conflict that resulted in Ethiopia’s subjection to Italian rule. Often seen as one of the episodes that prepared the way for World War II, the war demonstrated the ineffectiveness of the League of Nations when League decisions were not supported by the great powers. Under Generals Rodolfo Graziani and Pietro Badoglio, the invading forces steadily pushed back the ill-armed and poorly trained Ethiopian army, winning a major victory near Lake Ascianghi (Ashangi) on April 9, 1936, and taking the capital, Addis Ababa, on May 5. The nation’s leader, Emperor Haile Selassie, went into exile. In Rome, Mussolini proclaimed Italy’s king Victor Emmanuel III emperor of Ethiopia and appointed Badoglio to rule as viceroy. In response to Ethiopian appeals, the League of Nations had condemned the Italian invasion in 1935 and voted to impose economic sanctions on the aggressor. The sanctions remained ineffective because of general lack of support. Although Mussolini’s aggression was viewed with disfavour by the British, who had a stake in East Africa, the other major powers had no real interest in opposing him. The war, by giving substance to Italian imperialist claims, contributed to international tensions between the fascist states and the Western democracies. Melese Like his role Model Mussolini Will be Hanged in Addis … the moment of truth will not be long with coming North African Social Tsunami that swetp away his friend Mubarak.